When it comes to vacuum cleaners, commercial vacuums are in a complete league of their own. Whether you run a cafeteria, a janitorial service or an office building, a commercial vacuum is an essential cleaning tool to help keep your business premises spick and span. After all, cleanliness is one of the key factors to creating a great impression of your business. More importantly, a clean business environment makes it safe for you, your customers and your employees. What is a Commercial Vacuum﻿﻿? In a professional cleaning setting, the best commercial vacuums are powerful and efficient cleaning equipment designed for heavy and prolonged usage. Think of the commercial vacuum as a home vacuum in “beast” mode – designed to be more durable, efficient and effective at vacuum cleaning. Commercial vacuum reviews will tell you that these vacuum cleaners are handy when it comes to cleaning large spaces like conference rooms and even stadiums on a frequent basis. What Should You Consider ﻿When ﻿Buying a Commercial Vacuum? Now before I jump into my top five picks of the best commercial vacuums, these are some useful questions that you should consider if you are looking to buy a commercial vacuum. Try having answers to these questions in the back of your head before you start ploughing through commercial vacuum reviews. You’ll find it helpful to take a more targeted approach when it comes to researching for your ideal commercial vacuum! Yes, I do mean this literally. Vacuum cleaners come in all shapes and sizes and the commercial vacuum is no exception. If you have read my other vacuum articles, you may already know what backpack vacuums and upright vacuums are. Of course, there are many other types of vacuum cleaners and the right commercial vacuum type depends on your needs. As the name suggests, backpack vacuums are designed to be carried by the user like a backpack. This allows users to operate the vacuum for a longer period with free hands to manage the wand, power cord, other vacuum accessories or shift furniture around for ease of cleaning. This is a great commercial vacuum for janitors and other industrial cleaners. You can check out my article on Best Backpack Vacuums for a roundup on my top five backpack picks. A canister vacuum has a cleaning head at the end of the vacuum wand, which is attached to the vacuum unit through the hose. Canister vacuums are the ideal commercial vacuum if you need to clean stairs or hard-to-reach places such as areas under furniture (chairs, tables, etc.) and above ground (upholstery, drapes, etc.) in a restaurant or an office setting. You don’t need to move the entire vacuum unit with every cleaning pass. In general, canister vacuums are lighter, more maneuverable and quieter than upright vacuums. Upright vacuums are one of the more popular vacuum types and you’ve probably had one at home. For commercial vacuum needs, this is a great option if you want a vacuum for general purpose cleaning. This is a self-contained vacuum that can be rolled out to clean the area once it’s plugged in. Commercial-grade uprights typically come with long power cords that are at least 30 feet long. A wet/dry vacuum is the perfect commercial vacuum to clean up any type of mess, whether it is dry or wet. This is a great cleaning equipment that eliminates the need for mop work. For professional cleaning services, this is a must-have for fast and effective cleaning. Just be mindful that wet/dry commercial vacuums tend to be noisier. Also, consider one that has a drain valve or drain hose for ease of emptying liquids from the tank. At first glance, bagless commercial vacuums may seem like an obvious choice. While it’s true that bagless vacuums don’t come with the cost of disposable vacuum bags and the hassle of emptying these bags, these commercial vacuums also have additional filters that need to be cleaned and replaced every now and then. Moreover, dirt and dust may fly when emptying the dust cup from a bagless unit. For commercial cleaning, this may be an issue, especially if the dust cup capacity is small, which means that it needs to be emptied more often. Another of your concerns would be workers who may have allergies or asthma. For bagged vacuums, most of the dirt and dust remains within the bag for disposal. Unless you rip the bag apart, accidental spills are unlikely to happen when it comes to bagged commercial vacuums. When considering which commercial vacuum to get, be sure to choose one that is equipped to handle the target “terrain”. When it comes to cleaning hard floors, most upright commercial vacuums will do the job well. It is important to check out the cleaning heads and accessories that come with the commercial vacuum. For instance, certain canister commercial vacuums may not have a cleaning head that is suitable for cleaning hard floors. If you are cleaning large spaces where the power outlets are few and sparsely located, you may want to make sure that your commercial vacuum comes with a power cord that is much longer than the standard length of 30 to 40 feet—about 50 feet long would be a better option. If you are cleaning areas where people will be present, such as libraries and offices, you may want to make sure that the commercial vacuum you use is especially quiet or comes with different settings for a quieter cleaning mode. Now that you have a better idea of the different commercial vacuum types and what you should consider before making your purchase, here’s a list of my top five picks of the best commercial vacuums. I have consolidated this list based on the latest commercial vacuum reviews. To cater to different needs, I have selected five different types in my list of best commercial vacuums. 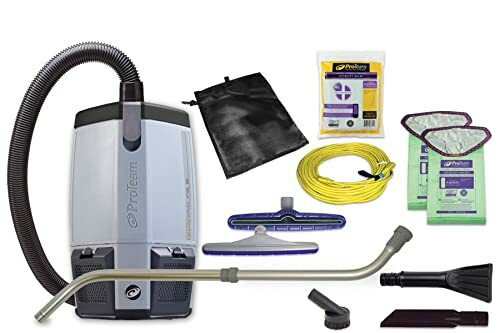 As you may have read in my article on Best Backpack Vacuums, ProTeam is one of the reputed brands when it comes to commercial vacuums. The Proteam Super CoachVac was my top backpack pick for general commercial cleaning. This commercial vacuum provides powerful suction and comes with a 50-feet long power cord which makes it convenient to clean large spaces. It also comes with HEPA filtration and a three-year warranty. Depending on your needs, there is also a variety of tool bundles to choose from: a 8-piece commercial tool kit with a 2-piece wand or a telescoping wand, an 8pc tool kit designed for small businesses and a residential cleaning service kit. With an ergonomically-friendly and lightweight design (11lbs), this is a great commercial vacuum choice if you are looking for a backpack option. Judging from the commercial vacuum reviews of the Proteam ProVac FS 6, this is a worthy high-end purchase. For a more detailed commercial vacuum review of the Proteam Super Coachvac, hop over to my article on Best Backpack Vacuums to find out more. 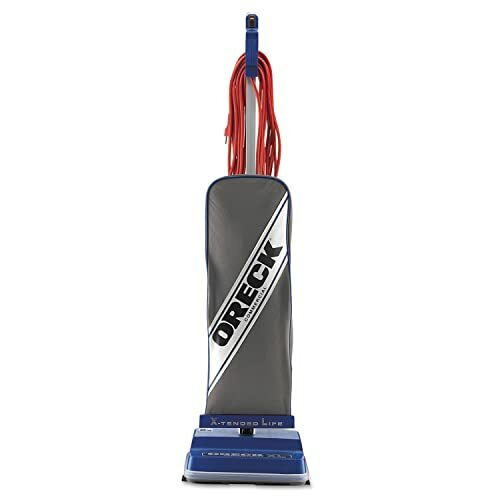 At only 8.2lbs, the Oreck Commercial XL2100RHS is the lightest commercial vacuum on the list. This comes in handy if you are cleaning large spaces and need to push the vacuum cleaner around. Its side edge brushes provide effective cleaning when it comes to not so accessible areas like corners. Its low-profile design allows you to access tight spots and areas that are below furniture. Other noteworthy features include its exclusive helping hand handle as commended by the Arthritis Foundation. Several commercial vacuum reviews of the Oreck Commercial XL2100RHS have remarked that this is a “sturdy, inexpensive, light and effective” commercial vacuum that does the job well. The only small pickle with this commercial vacuum is that it doesn’t come with a hose, which means that you won’t be able to clean areas that are higher up such as blinds and draperies. Nevertheless, if you intend to clean such areas with another handheld vacuum, this commercial vacuum is still a worthy buy for its nifty features and mid-range price tag. The Hoover CH30000 is a great buy if you are looking for a canister commercial vacuum. For just above $100, you get a lightweight and portable commercial vacuum with a full array of attachments and accessories. This is an excellent cleaning equipment if you are cleaning apartments and offices where there are hard-to-reach places like draperies and furniture. Based on the commercial vacuum reviews on Amazon, it seems that the Hoover CH30000 is great for carpet and upholstery cleaning, but doesn’t work so well for removing pet hair. Other than that, another downside is that this commercial vacuum doesn’t come with wheels, so it needs to be carried. That said, it is very lightweight at just 8.3lbs. For greater convenience, you can get a separate carrying bag for the vacuum for less than $30. If your target “terrain” does not include pet hair, the Hoover CH30000 makes for a value buy with its affordable price point and decent features. Most commercial vacuums are bagged, so I decided to throw in a bagless option for those who are thinking of getting a bagless commercial vacuum. This upright vacuum has a decent dirt cup capacity of 1.58 dry quarts and a 30-feet long power cord. Like other Hoover upright vacuums, the Hoover UH73220PC comes with the company’s proprietary Wind Tunnel technology specially designed to trap all sorts of debris and the multi-cyclonic technology that prevents suction power loss for a consistent cleaning experience. What’s more, this commercial vacuum can be connected to the Hoover app for a customized cleaning experience. Its FloorSense technology employs micro-sensors to detect changes in floor types while cleaning and make automatic adjustments to the brush roll speed accordingly. It also comes with a full suite of tools such as a crevice tool, dusting brush, pet upholstery tool and a pet turbo tool. 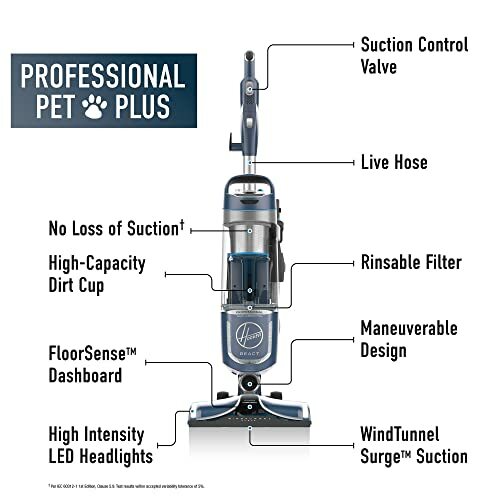 While most of the user reviews were not commercial vacuum reviews (the customers were mostly home owners with pets), I think that this would be an excellent commercial vacuum for fuss-free pet hair removal if you run a pet rescue shelter or a pet hotel. 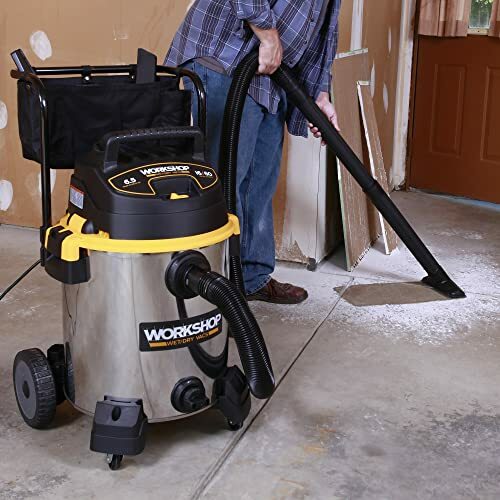 For a top-notch wet/dry commercial vacuum, look no further from the Workshop WS1600SS. This commercial vacuum combines power, durability and mobility all in one with the added capability to clean up both dry and wet messes. The Workshop WS1600SS can pick up a maximum of about 1 gallon of water per second. If you have read my article on Best Backpack Vacuums, you may recall that specifications like the vacuum’s airflow measured in cubic feet per minute (CFM) provide a good indication of a backpack vacuum’s suction power. This applies to wet/dry vacuums too. The Workshop WS1600SS boasts of a maximum airflow of 167 CFM. In terms of liquid pickup, its sealed suction can go up to 45 inches. Based on the many rave commercial vacuum reviews, it seems that the Workshop WS1600SS lives up to the claims of its high suction power, useful selection of accessories and great quality featuring a stainless steel drum. To top it off, this commercial vacuum comes with a five-year warranty. If you are looking for a powerful workhorse that can handle all sorts of terrain and debris, the Workshop WS1600SS is the right commercial vacuum choice for you. Ultimately, the best commercial vacuum is the vacuum that will fit your requirements. If you only need a commercial vacuum to clean office spaces, the Workshop WS1600SS would be an over-the-top purchase and might even be too bulky for your liking. Likewise, if you need a heavy-duty commercial vacuum that can withstand tough terrain, be prepared to spend $200 and above for a decent vacuum.